Princess Nagger Licor del Café is a coffee- flavored liqueur that is made from the finest coffee, Vodka, Brandy and organic Vanilla Beans. is dark brown in color with a body that is sometimes thicker than most other types of alcoholic beverages. It’s not thick to the point of being syrup- like in consistency, but it is thicker than the stronger types of liquor and most other types of liqueur. This liqueur is sweet, and its taste characteristic is primarily coffee, but there are other tastes that are present as well. Served on the rocks, you can taste a roasted flavor along with a touch of vanilla. Some have suggested that the taste of chocolate is also present. Mix 2 parts vodka with 1 part Princess Nagger Licor del Café, then add cream or half and half. Mix equal parts of vodka, Bailey’s Irish Cream, and Princess Nagger Licor del Café (it’s also popular to blend this with ice and serve as a frozen drink). Mix 4 parts soda water, 1.5 parts whipping cream, and 1 part Princess Nagger Licor del Café. Mix equal parts of Amaretto and Princess Nagger Licor del Café, then add cream. Mix a shot (1 to 1.5 oz.) 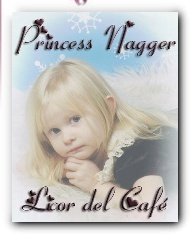 Princess Nagger Licor del Café with a cup of your favorite hot coffee. There is no distinct recipe or formula for this. It can be black coffee, or coffee with sugar and cream, whatever fits your fancy. 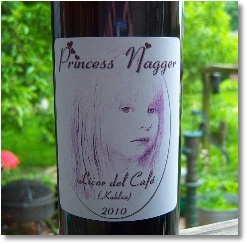 Princess Nagger Licor del Café is a favorite type of liqueur. The taste is reminiscent to a good glass of stout or port. The emphasis on roasted coffee with hints of vanilla and just a touch of burnt flavor is very similar to the taste that you will find in many of the world’s best stouts and/or ports. The versatility of Princess Nagger Licor del Café is as wonderful as the taste. Not only does this liqueur make great- tasting drinks, but it’s also an excellent addition to many recipes, including cakes, brownies, tiramisu, pie, and other desserts. And it’s not uncommon to find recipes for other non- dessert foods that call for Princess Nagger Licor del Café, like salsa, teriyaki beef and chicken, and others. Overall, this is an excellent liqueur that is enjoyed by many. Who can resist the taste of a Toasted Almond or Mudslide? 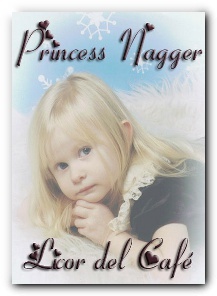 Try some Princess Nagger Licor del Café today, and see how good- tasting coffee liqueur can be. It tastes great in mixed drinks, and even straight-up, all by itself, and it’s an essential addition to any liquor cabinet. Made with Premium Russian Vodka and Holiday Spiced coffee (smells like spiced Chocolate) - each batch outshines the last. Limited quantities available. Receive a 10% discount on 6 bottles, 15% discount on 12. You may also request your own custom labels to give as gifts for a special occasion - email me for information.